Peter White's first steps into music business were as a member of Al Stewart’s band. Although engaged as a keyboardist he played a prominent role as guitarist on Stewart's mega hit Year Of The Cat. Peter also played guitar on some of Matt Bianco's releases. Danny White and Basia are the members of this group. He started his solo career with the 1990 release of Reveillez-Vous (Wake up). Excusez-Moi (1991), Promenade (1993) and Reflections (1994) followed on Sindrome, Caravan of Dreams on Columbia (1996), Songs of the Season (1997), Perfect Moment (1998), Glow (2001), Confidential (2004), Playin' Favorites (2006) and A Peter White Christmas (2007) on Sony Music. Good Day (2009) is his first album on Peak Records, a division of Concord Music Group. The album was produced by Peter White and DC and co-produced by Philippe Saisse. The starting tune Good Day features Philippe Saisse on keyboards and vibraphone. A romantic song capturing the spirit of Peter's acoustic guitar. A novelty on a Peter White album is the stake of a vibraphone. "It's something I've never put on a record before, but I try to do something on every album that's a little different," explains Peter. 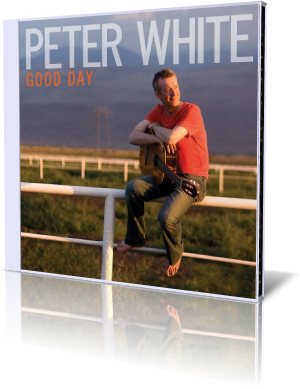 Peter White's affinity for sensual melodies shines on Always And Forever. He keeps the song simple but always captivating. The dynamic rises with Saisse's additional string arrangement, the melody all the time in view. My favorite is Just Give Me A Chance, an uplifting melody like an encapsulated sunshine. Saisse adds a perfect horn arrangement performed by Shannon Kennedy (sax, flute) and Dan Savant (trumpet, flugelhorn). (Un)Forgiven was penned by David "Kokoki" Kochanski, a brilliant musician who toured the world with countless others such as Britney Spears and Jessica Simpson, and also performed with Chaka Khan, George Duke, James Ingram and more. David validates his high potential on this great impressive song. On Temptation Peter creates a magical guitar dream perfectly underlined with Saisse's orchestral string background. Mission 2 Mars is a new level in the collaboration between Peter and Philippe Saisse. While Peter follows the acoustic guitar path, Philippe adds electronic novelties lending the song a hooking dynamic. We experience a Peter White, who is matured in music business. Good Day mirrors the wisdom of a guitar genius bringing emotion to every note. So try to attend his next event and holler and applaud him. He deserves it each time.